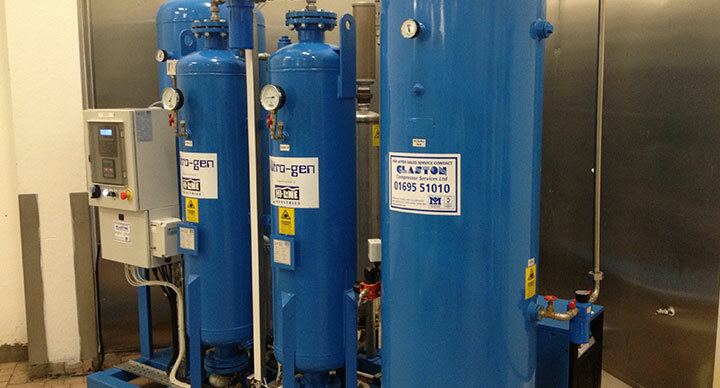 Here at Glaston Compressor Services, as a team of professional experts we are able to offer a complete range of compressed air treatment solutions and compressed air dryers, which includes refrigerated air dryers and desiccant dryers. Air compressor dryers remove water vapour and liquid water from compressed air. It is essential that compressed air is treated before use, as water vapour can have a number of harmful effects on your compressed air system. These harmful effects can include corrosion, erosion and contamination of your air compressor. Excess water can also drastically lower productivity, therefore by using an effective air drying system you are effectively increasing both maintenance and operating costs of your compressed air system. Compressor dryers are an essential piece of equipment that are used to ensure the continuous, optimum productivity of your air compressor. At Glaston, we also offer a range of desiccant compressed air dryers. Desiccant compressed air dryers use chemical beads to attract water from the compressed air via absorption. This process cleans the air to ensure that the highest quality is able to be produced. Desiccant compressed air dryers can also be referred to as regenerative dryers and twin tower dryers. Our compressed air dryers are extremely versatile and therefore can be used for a wide range of applications in all compressed air systems. Air compressor filter dryers are unquestionably an essential piece of equipment that can be used in a number of industries including the packaging, manufacturing and chemical industries.